Great! I love how you’ve combined this parka and leather jacket together! You look amazing. I love your parka. Kisses. You know already HOW MUCH I like to see you in that Neon yellow!!!!???? Love the combo of Parka and that leather jacket! The BAG???? GORGEOUS just like her new onwer….TOI!!!! Gorgeous, love everything you’re wearing! Great layering! Love yellow and black leather combination! awesome bag and really great outfit! I love that bag! it goes with everything, and also your layering is a fabulous combination of two of my favorites trends: parka and neon! The bag belongs in the hall of fame. Cute outfit too. Thanks for posting the photos and feel free to drop by me too when you have time. awesome outfit ! LOVE IT. Love the neon Top… A perfect combination for black pants. Great look! I just love how the yellow shirt pops out from the outfit! Wauw! Thnx a lot for your comment!! You have such a great blog! And i really really lve your style!! I love your look. Jacket and parka it’s a great idea. Love your neon top too. great look! Love the colors combination! THE LEATHER PEEKING OUT FROM THE KHAKI JACKET LOOKS GREAT! You look great in neon! Great choice on matching this bag with neon =) This bag looks like a comfy size where you can match it with any weekend outfit! Cool! great post!! love your blog!!! following now sweetie! would love if you followed back on my followers list! Love your neon mix outfit, amazing! Thanks for the comment :D Really loved your blog ! And you’r from NY *. * So lucky !! Love it! I like the neon touch at this dark outfit! And the old gold of the bag is the cherry at the cake! Fantastic bag! I like the way you worked your layers. Love your style, the ring and bag are amazing! So happy I stumbled upon your blog!! Me gusta la mezcla de parka con cazadora de cuero, muy chula. Amazing outfit and beautiful photos! Love the bag and shoes! Excellent combination of these two jackets!!! Oh, How I love your blog and your style! Yu’re amazing as allways. I love your sunglasses and parka jacket. The pop of neon is such a great touch! Gorgoeus as always! that is a gorgeous bag…. and you look amazing! great jacket combo… and the colors are so stylish, veronica! 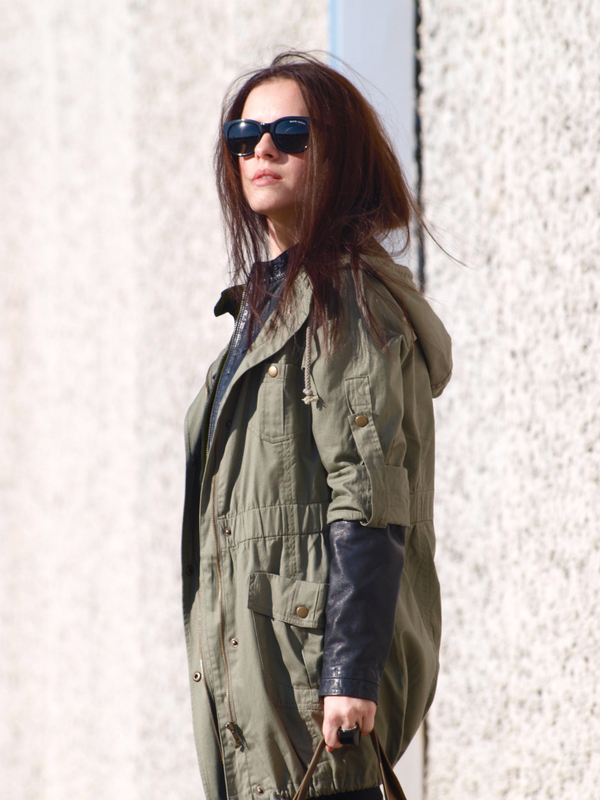 Love the layering, you just reminded me thta I ought to pull our my lightweight parka for when the suns out again! You look beautiful, perfect outfit! I love how you paired the parka over the leather – i’ve been inspired! I love the way you layered it!! LOVE the yellow, you’re wearing it so well! What a cool ensemble!! It is very effortless. Good job!! Thanks for stopping by my blog. I live this layered look. I have similar pieces, just might have to steal it! love the pop of neon!! I love this look!! !Such a cool idea to have that parka ove the leather jacket! love it! have a great weekend!